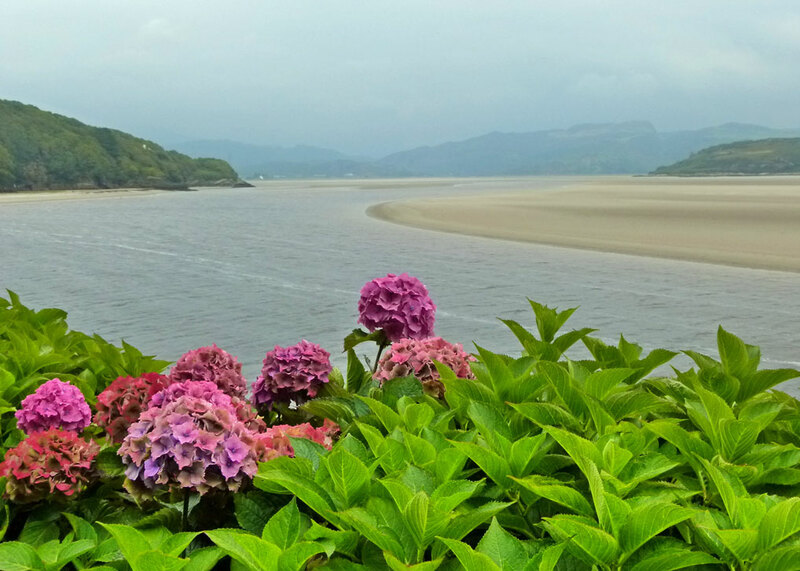 Portmeirion is one of those places you hear about and think you really should visit. Or you want to go because the 1960s cult TV series, The Prisoner, was filmed there. The Prisoner was ‘No 6’, played by Patrick McGoohan, held captive in a plainly weird village from which he tried to, unsuccessfully, escape in every episode. Filming began at Portmeirion on 5th September 1966 and the series kept people guessing right through to the end. The BBC ran a good piece to mark the 50th anniversary of The Prisoner. McGoohan had previously achieved fame as the secret agent John Drake in TV’s Danger Man and, among other film credits, went on to play the nasty warden in Escape From Alcatraz (1979) and an equally nasty King Edward I in Braveheart (1995). 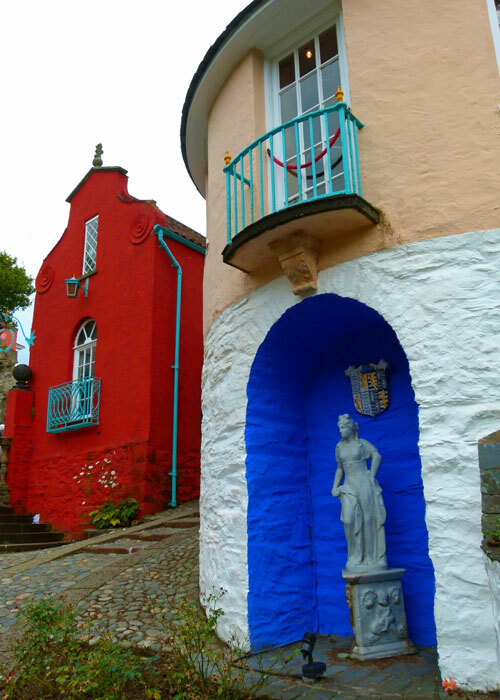 That aside, Portmeirion is a fascinating creation, snuggled (or should that be ‘smuggled’?) into the North Wales coast. It is a fairy-tale model village but on a life-size scale – rather like a kind of early Disneyland without the cartoon characters and the rides (though there is a road train that takes you on a bumpy, but worthwhile, trip through part of a 70 acre forest). Instead of Donald Duck, imagine Patrick McGoohan, mean and moody and numbered in his striped jacket – which you can buy a replica of for an exorbitant price. 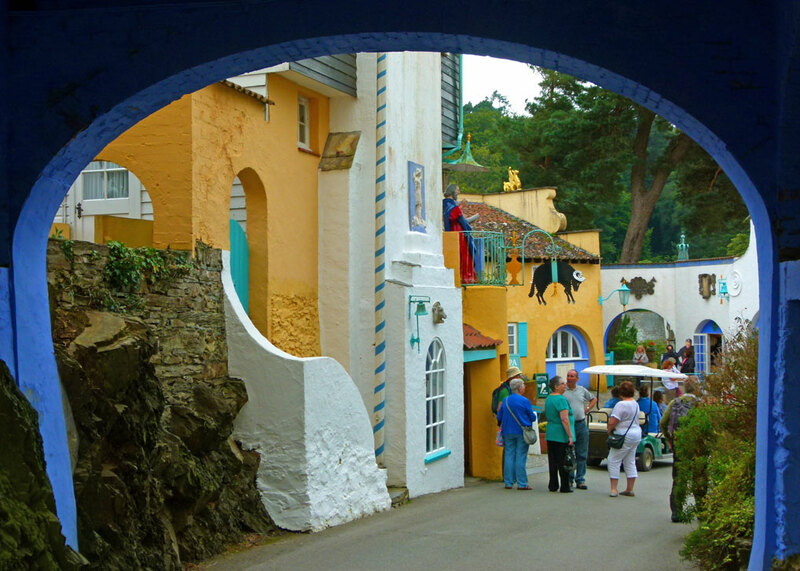 There’s no real purpose to Portmeirion, except as something to wonder at and enjoy. The brainchild of architect Sir Clough William-Ellis (1883-1978), it was constructed entirely from scratch – except for a couple buildings – between 1925 and 1975 on what was previously ‘a neglected wilderness’ on the North Wales coast. It is meant to be based on an Italian village and, apart from the singularly North Welsh weather, it certainly has a Mediterranean feel to it. The buildings do look a little tired in parts – paintwork peeling in places, that kind of thing – though it must be an enormous task to maintain. 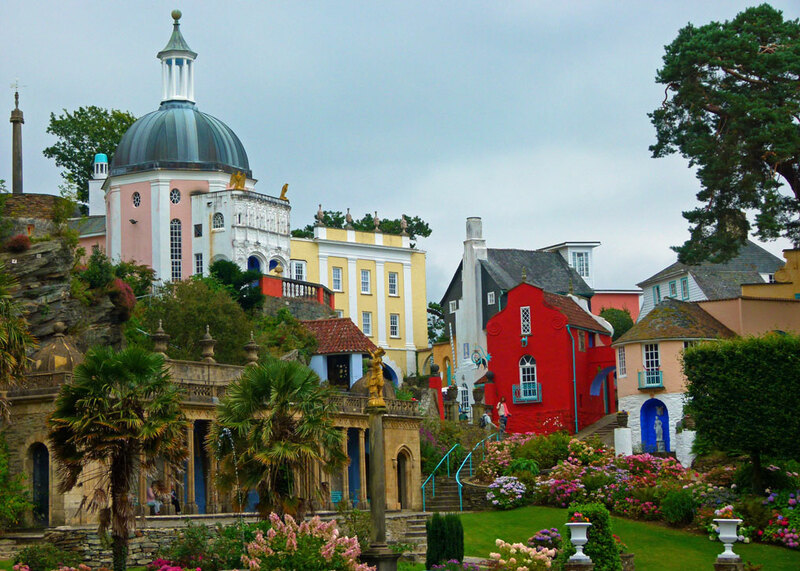 But, overall, Portmeirion is stunning – and it’s an astonishing memorial to one man’s dream. Because that dream was realised, it is also curiously uplifting; how many people get to build their dreams? Clough William-Ellis proved that you can. The structures are not all original; some have been creditably salvaged from other places. The result is an odd mixture of peasant-neo-classical-baroque plus some. There’s not a lot to do, except wander round; but take your time, because there are little surprises all over the place. 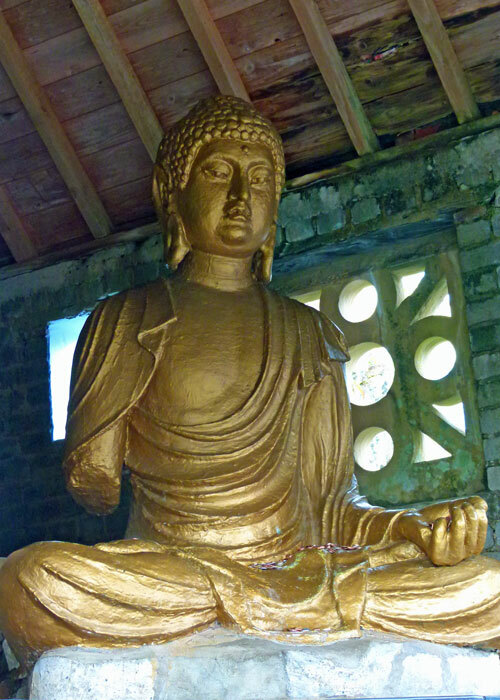 A statue of Buddha, for example, was a film prop for the 1958 movie Inn of the Sixth Happiness, starring Ingrid Bergman. Some features are genuine antiques, quietly residing in this unique bit of ersatz Italy in Wales. We were welcomed at the gate by smartly-suited greeters, who charmingly relieved us of our entrance fees before sending us on our way with a little map. The policy of sartorial elegance evidently applies to other male helpers, though it would be a nicer touch if they all knew how to carry a suit, or had been kitted out with the right size. As it was, some of them looked rather uncomfortable, like refugees from a dodgy wedding party. Perhaps they are; you can hold a wedding celebration there if you want. I also felt that several of the staff could do with an infusion of smile tonic; whilst sincerity should be welcomed, getting served by grumpy people doesn’t do much for my ‘visitor journey’. It is also worth mentioning Café Glas, where we repaired for a tea, coffee and the ubiquitous buns, and where we experienced an unusual approach to customer service. Not only did we think we’d been forgotten, but when our order eventually arrived it did so in stages, one item at a time. It was terribly exciting…what would come next, we wondered? The waitress was very sweet and seemed quite relaxed about making 47 trips to our table – perhaps she was in training for something. Then, it was a little disconcerting to see on the bill that we had been served by someone called Gareth. Portmeirion is 1½ miles south of Porthmadog on the A487, down a very long drive. I really must see The PRisoner. I have been meaning to for years. Maybe I should stay there like one of the other commentors on this post, and have it playing on every television. Now that would be weird! It is the kind of place I’d love to come across by chance, and perhaps painted in paler and less obtrusive colours. You’ve got me thinking I should watch it too. I have a friend who has a box set of the whole thing. We stayed in one of the little apartments in the village and when we arrived the television in every room was turned to constantly show “The Prisoner” episodes. The whole trip was delightfully offbeat; charming, and odd all at once. Thanks for the article. It brought back great memories. Fabulous – I think it would be fun to stay there, but probably not for too long! Thanks so much for dropping into ‘ABAB’ and leaving a comment. Next year we really must visit! 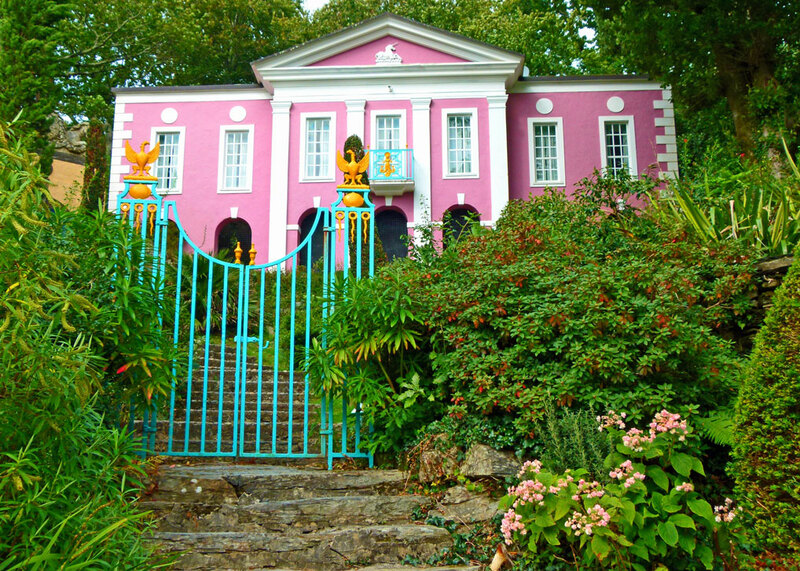 I’ve always wanted to visit Portmeirion, but now that I know that, if I’m patient, I coud be served tea by a lovely waitress called Gareth there, I definitely need to go! 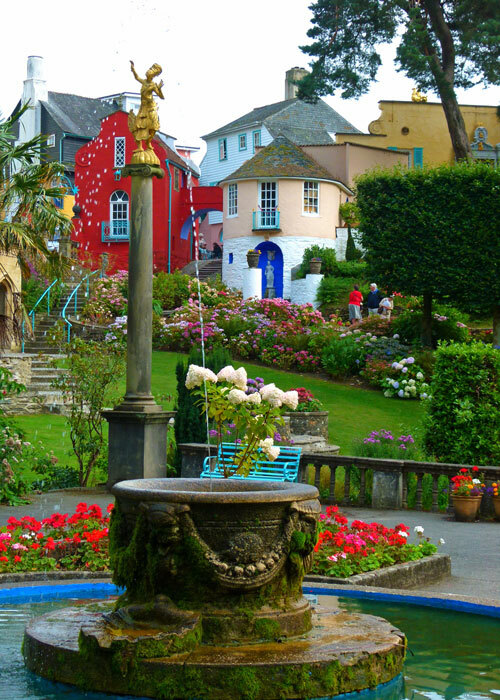 I’d like to see Portmeirion, it looks very attractive from your photographs. I love the second photo – this really does look like a Mediterranean village and the blue archway framing it just finishes it beautifully.. 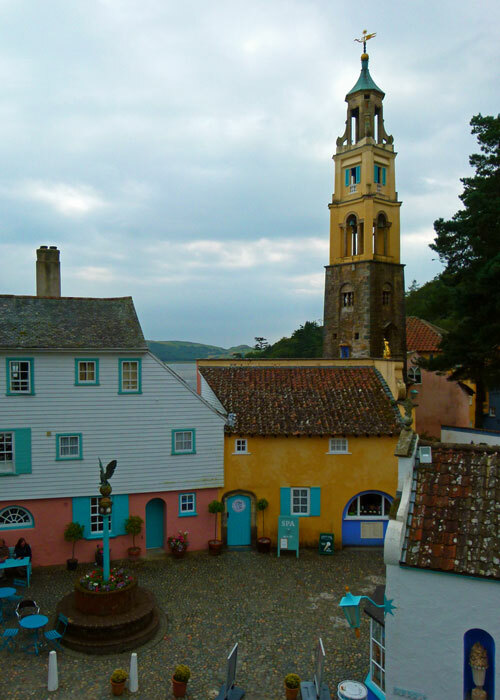 I remember watching The Prisoner but didn’t know that it was filmed at Portmeirion. So picturesque! Adorable. I wonder if everyone knows everyone there and it’s a small town mentality, or if they get transience. I think it’s probably a heavy dose of the latter. What an interesting place! So colourful and attractive. Remember “The Prisoner” too! My parents took me to Portmeirion when I was a child – I remember being bold over by how different it was to anything I had ever seen before. I recall seeing bright but softer colours, it was what they would call shabby chic today – nothing like as colourful as you have shown on your lovely photos. A very, very weird place this looks, like something out of a dream! And to be honest, not really Italian. I wouldn’t say I’m an expert on Italy, but I was married to a Sicilian and spent every summer on the island for ten years, plus a couple of holidays in Tuscany – only a few architectural elements in your pictures remind me a little of Italy. That does not mean it is not a fascinating place! The Prisoner or I should say “Le Prisonnier” was one of the first adult show my parents let me watch. I was just a little girl then (maybe 6 or 7) and I was both fascinated and terrified by whatever it was I could understand from the plot. I think I’ve only seen it in black and white so all these colors seem a bit odd to me. I also read the BBC article and thought it was very interesting. Thank you! I think that many large organisations think we are all merely numbers! I imagine it is a fascinating place to visit! 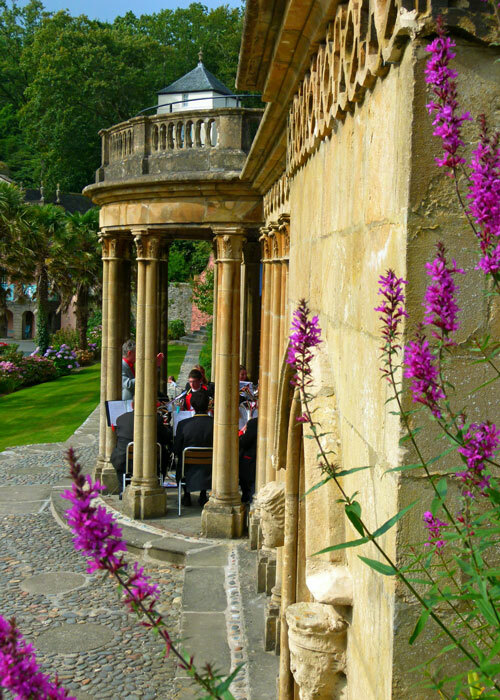 Another great place in Britain that you have taken us to! I haven’t seen the programme for years, but have a vague memory of it being fairly weird. A good chum is a fan – I should borrow the DVDs and give it another go! Hi Mike, I was really interested to read this post! My hubs and I used to watch “The Prisoner” when we were first married and living in our little townhouse, back in 1987 and ’88. The place was small, and there was no yard work to do, so we watched a lot of TV. 😉 I never cared much for “The Prisoner;” it was too strange for my taste, but Hal was a fan. I’ve just shown him your pictures, and he was quite impressed. We both thought that show would have been filmed on a “set.” It’s amazing to think that’s a real town. The architect really went in for color, didn’t he? 🙂 It is a beautiful place and quite fanciful. I got a laugh out of your description of the Cafe Glas — too funny. By the way, there is a line of dishes called Portmerion, and I’ve loved them for years. They’re lovely and quite pricey, so I don’t have any. I enjoyed your post — hope you have a good week! A fascinating, strange, and colourful place. I never saw the series, but one of the other things I liked McGoohan in was several takes as murderers down through the years on Columbo episodes. One of your best reads yet! I laughed out loud at the waitress and tea shop story. Every one of your posts is a joy to read. Thank you for making this Yank feel like she is touring Britain. Thanks, Susan – that’s a huge compliment! How interesting! And colorful! Your description of the cafe made me laugh – hope you weren’t dying for your tea while Gareth the waitress made all those special trips. Maybe I was a bit heavy with the ‘vibrance’ setting! I visited there with friends in the 1980s. The colours look much brighter than I remember them but we arrived on a dull wet day as it was a rock climbing trip and this was our rest day due to rain over the mountains. A great place. The Prisoner was one of the first quirky but excellent TV programmes I remember and broke new ground on television although by the final few episodes it had lost most of its audience as it became increasingly surreal and few liked the ending. A bit like the X Files. I remember walking for miles along great beaches there which were the real unexpected surprise. Maybe the colours have grown more cartoon and Disney like rather than pastel flavoured as that’s what tourists expect they days with vivid computer games and Pixar films. It was a grey day when we visited, to be fair. Definitely worth a visit, but not somewhere I can envisage spending loads and loads of time in, personally. It’s definitely worth seeing – when you’re next in North Wales. Quite a colorful place, looks interesting and we always enjoy Wales. Oh, I WILL look at The Prisoner. My kids have been telling me to do so for ages. I should have visited Portmeiron before it became so famous. A shame that it isn’t now being run with the same love that Clough W.E. brought to it, but your pictures give a good impression of the way it looks today. In fact I would have liked to see more photos. I think I took far too many photos of pretty much the same thing! I stayed there once. I knew very little about it except for The Prisoner and I didn’t really make the connection, even then. I was on a driving holiday and taking pot luck on where I could stay. I visited because I knew it was there, and saw a little sign in one of the nooks or crannies that said “did you know you can stay at Portmeirion?”. So I did. I had a suite in the gatehouse – that yellow thing in your top photo. The two windows of the first floor that are just visible were MY windows. It’s priced itself out of my range now, but back then it was no more than a standard B&B. After the visitors went home and I had the place “to myself” I felt wonderfully privileged to be able to wander wherever I wanted, and to ignore the signs that said “residents only”. I recommend it.